Can I Use a BLU Smartphone With the Straight Talk Verizon Network? Will Verizon SIM card work with Blu Studio 6.0 phone that has Straight Talk service? No, the BLU Studio 6.0, and all the other BLU models will not work on the Verizon network. BLU phones are compatible with the AT&T and T-Mobile networks that use GSM / LTE technology. They will not work on the Verizon or Sprint networks that use CDMA / LTE technology. I hope this helps, if you have any more comments or questions. Leave a reply below. I just saw a BLU device ad which are saying that beginning in Feb.2019 distributing BLU devices by carrier Verizon, which was last month. You could use it with Straight Talk’s AT&T or T-Mobile SIM cards. But I would recommend buying a new phone. 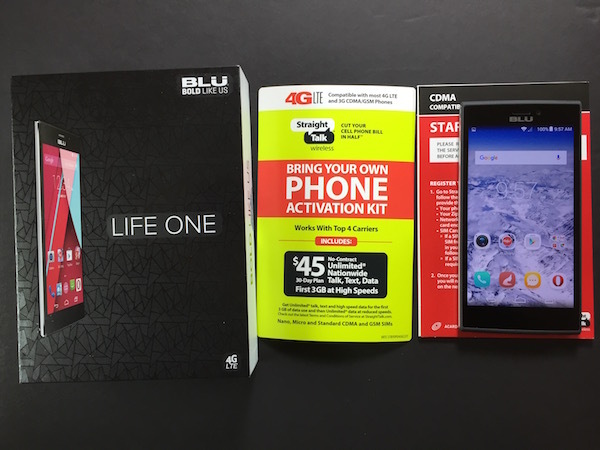 The BLU phone doesn’t use 4G LTE only GSM, You’ll be paying $35 to $55 per month for a plan and won’t be able to use the 4G LTE data you are paying for. If you were going to sign up for say a less expensive service like Tracfone, I’d say you maybe use that phone. Also, that BLU phone is probably still using a version of Android that is 4 years old without any security updates. Do you know how much data you need? Which plan you were going to choose? And if you had a choice, would you want your phone to use the AT&T, Verizon, or T-Mobile networks, that is, do you know if one of those three has the best coverage where you use your phone. Yes, BLU Phones do work with straight talk, and quite well. 1. If u don’t understand difference between GSM and CDMA networks, let ur son buy ur phone for you. 2. I realize this post is from 2016, but that’s exactly my point. If u just purchased a shiny new S9 galaxy, well guess what, that means the S10 will drop soon, and the S11 is already in a warehouse somewhere. People remarks about these BLU phones being crappy, and dropped calls, again let your son or daughter set up ur phone. These phones have Dual Sim cards people. I’m a disabled US Marine who served in combat in Iraq and a die hard American, but wake up, open ur mind. Stats just out, chinese phone maker just smoked Samsung galaxy S9+, and the Apple IPhone X. Try reading, researching, and listening, instead of talking, you might just learn something. I bought this phone for to work for my verizon number. BLU phones are not compatible with verizon’s network. The Moto phones are unlocked, a good price, and compatible with verizon’s network. Are you using Straight Talk verizon or Verizon (the company)? Are you saying that your Straight Talk coverage using the ATT towers has gotten worse over time? I’m not sure what the problem you are having is. Can you describe it more clearly? When I first got a Blu phone in 2014 that is why I got it worked fine. Walmart in my area is still selling the sim card pack as though it is compatible. Do you know when, why & how it changed?! I pay straight talk to run on AT&T towers?!! And service is less than good!!!Grrr! I have a Blu one life xl. Not compatible with Verizon I come to find out…after I purchased the phone. So is the GSM LTE sim the way I have to go for this model also our is there a way to make it work/compatible/unlock??? BLU phones are sold unlocked and compatible with the AT&T and T-Mobile towers for Straight Talk. I am guessing that phone is using Straight Talk’s AT&T towers so if the SIM fits it the phone it might work. Sometimes with older phones the SIM may have been tied to the phone. Try it and see if it works. Yes most GSM phones work with verizon now, due to the 4g LTE being. Sim neteork. Asking as your device supports band 2 and 4 you are good to go. thanks for leaving a comment but I disagree with you. BLU devices do not support the Verizon network. You will not be able to register the IMEI of the device for use on the Verizon network even though Verizon uses CDMA and LTE technologies. I recommend the Moto E and G series unlocked Android phones if you want to use Straight Talk’s Verizon towers. Can I use prepaided virgin. mobile phone with. Tracfones. Bring your phone because I’ve looked on there forum boards.